It is important to laugh. Laughter is good for you. It is believed to be good for the immune system, and it reduces stress hormones. It also causes endorphins to be released. It just makes you feel better, and it can briefly reduce pain levels. If you want to laugh, you have a few options. There is talking to a friend, of course, but most of us don’t have friends that are particularly funny. Personally, I like watching television when I need a laugh. I don’t care if “Seinfeld” is over twenty years old—it is still funny. You can also count on the internet for laughs. There are a ton of funny videos and pictures to keep you amused. Unless you are at work, there is no reason you should ever be bored. Even if you are at work, you probably spend a lot of time looking at pictures and videos on the internet—especially if you work in an office. 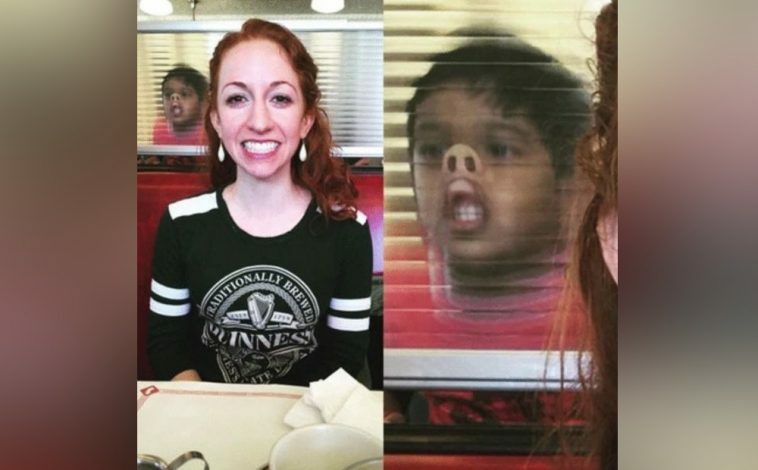 Here are thirteen pictures and stories that will likely amuse you and make you laugh. This young woman clearly loves tacos a lot. I like the dress, and she really does look very pretty overall, but I have to wonder about the why of it all. What event is she attending? A prom? A theme party? Is this a Halloween costume? If it is a Halloween costume, it is a pretty elaborate one. 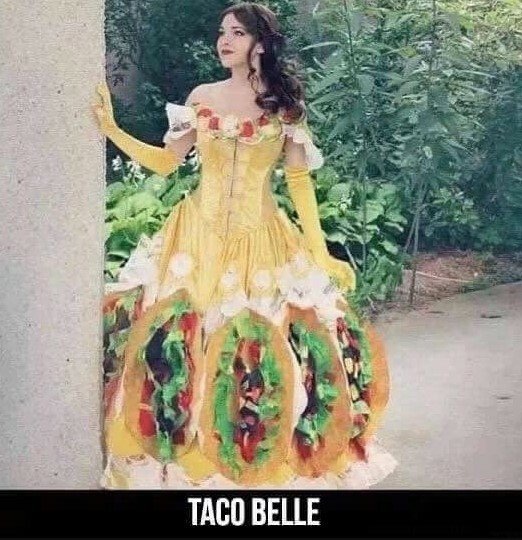 I am guessing that this young woman is, in particular, a fan of Taco Bell. I’m not a huge fan, but a very good friend of mine practically lives at one. Every time I see the guy, he wants to go to Taco Bell, and every time I have to remind him that I don’t care for the food. A lot of people love Taco Bell. It is a pretty popular restaurant chain, that’s for sure. 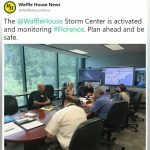 There are roughly 7,000 of them, and the chain’s revenue is close to $2 billion a year. The brand has been around since 1962. A lot of people associate Taco Bell with the United States, which makes sense considering it was founded in California, but Taco Bell restaurants can be found in many other countries throughout the world, including Sri Lanka, Spain, Romania, Canada, and Panama. This little post is more horrifying than funny. 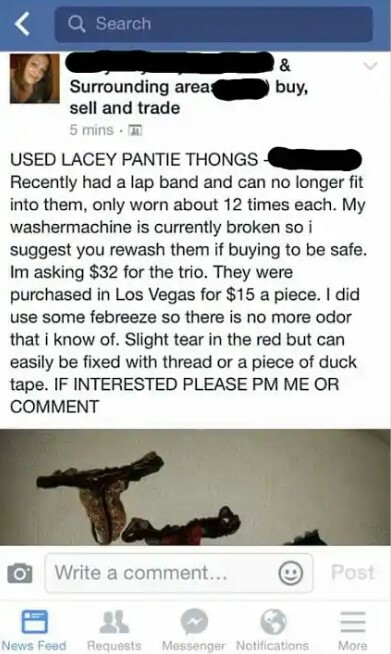 Who buys used underwear off the internet? Actually, a lot of people probably do, which is sort of disgusting to think about. We won’t go there. I really hope no one bought these to wear, though. I just can’t imagine wearing underwear that someone else has worn. I’ll wear a used t-shirt, perhaps, after it has been washed—but underwear? That’s just weird. And it isn’t like that’s a tremendous deal. She payed $45 for the three, but she’s charging $32. That’s not a deal. The Febreze thing cracks me up. It’d take more than Febreze to get most people to wear used underwear, although it is refreshing to know that the odor is mostly gone. It has only been around for 22 years now, but I don’t know how people lived without it. It really does do a great job of eliminating odors. I freely admit that I have used it on clothing instead of doing the wash. I’m sure most of the people reading this have done so. Sometimes you need to go out suddenly and don’t have time to do the wash. As long as you don’t smell, who cares? This is the sweetest note from a child to a mother that I have ever read. 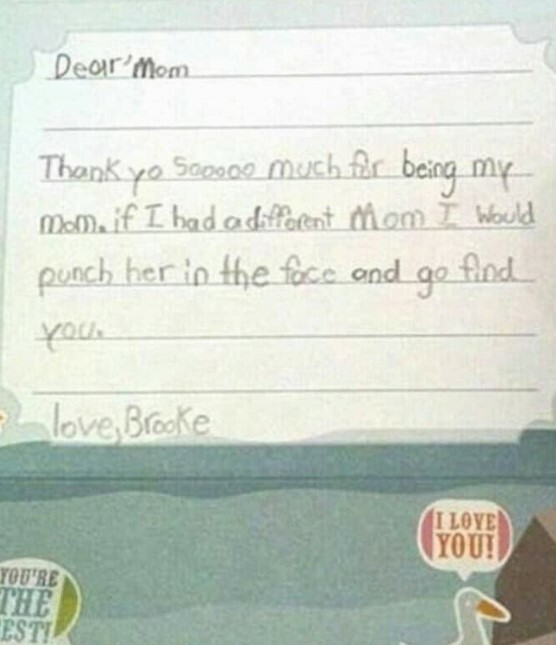 I don’t really know if little kids should be talking about punching adults in the face—little Brooke might need a trip to a child psychologist—but the sentiment is a sweet one. It must be nice to know that your kid loves you and thinks you are a good parent. I doubt Brooke will feel that way when she is fifteen, so her mom better be enjoying the love and attention while she can. The person who posted this apparently had his girlfriend stay over for the first time. 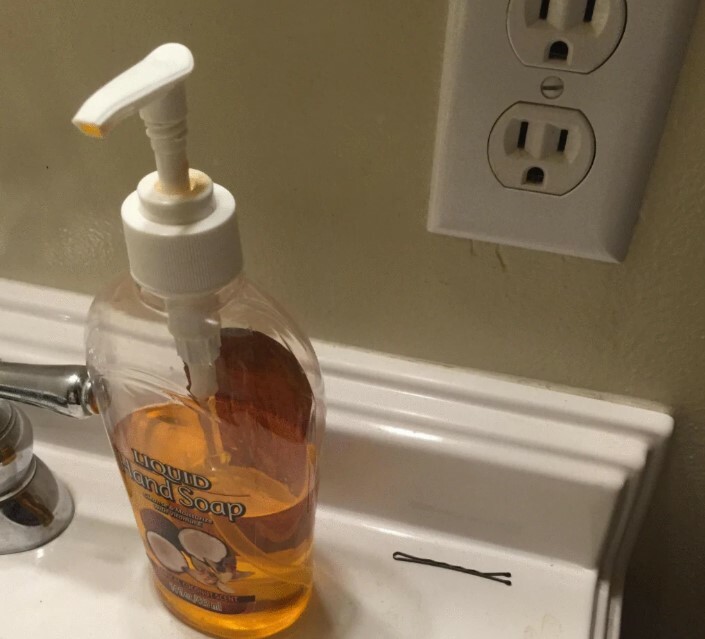 He’s freaking out over the fact she left a bobby pin on his bathroom sink. This guy clearly has commitment issues. If he is worried about a bobby pin, he probably shouldn’t be dating at all. She should probably try to find a guy that isn’t terrified about the possibility of a long-term relationship. There are probably a lot of men out there who would be happy to have her as their girlfriend. I am assuming this guy was drunk. He certainly looks like he has had about six too many. Still, you have to give him credit for trying, you know? 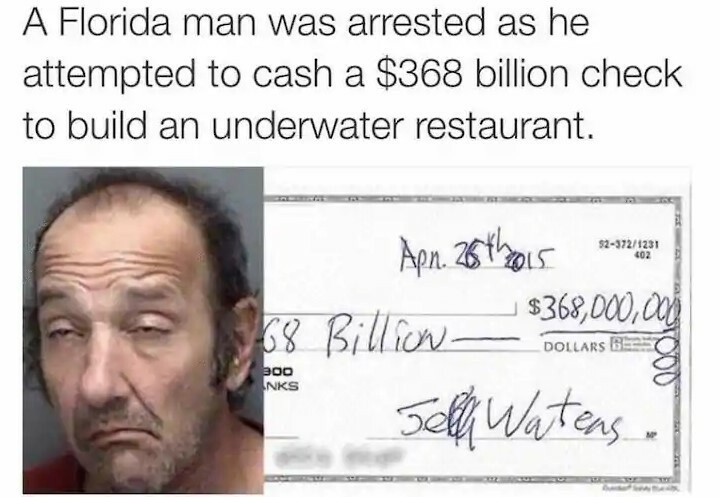 An underwater restaurant sounds neat, though. 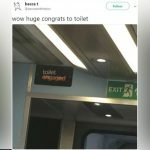 I would enjoy that. I am not afraid of sharks, and I have always wanted to see the bottom of the ocean floor. I’m surprised one hasn’t been built already, honestly. Can you imagine the prices, though? Just getting there would cost a small fortune, so you know the fries would cost $40 a plate. I assume it would be a seafood restaurant of some sort. At least you’d know the fish would be fresh. I would shop at this mattress store. People love their pets. 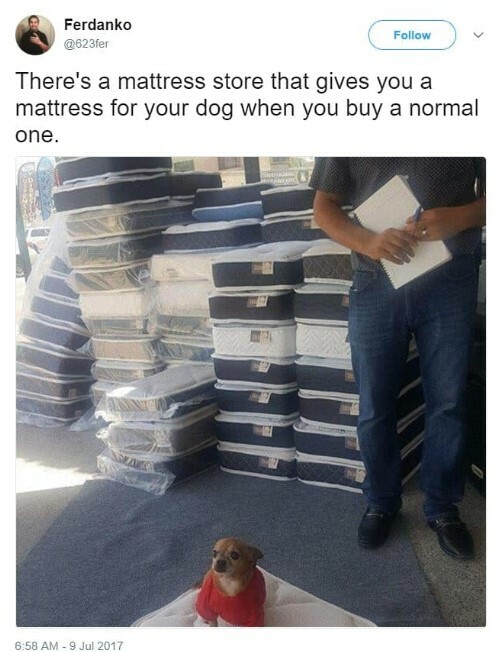 A free mattress for your dog is a great incentive to shop there. Most business owners tend to frown on dogs in their stores—at least in the United States, they do. It is their business, so they should be able to set the rules. To an extent, I understand. I have a dog, but he is one of those tiny little things. It’d be hard for him to do a lot of damage. He could probably bite a finger off, but that’s about it. Large dogs can be terrifying, though. I try to avoid them whenever possible. I have a friend who got his dog registered as a “therapy dog”. As a result, he can take his dog pretty much wherever he pleases. My friend is not blind or disabled in any way; he just claims his dog provides him the support he needs so that he can have the emotional strength to do things like shop at Target. At first glance, I thought this was a really tiny pumpkin. I don’t know why. I was wrong. 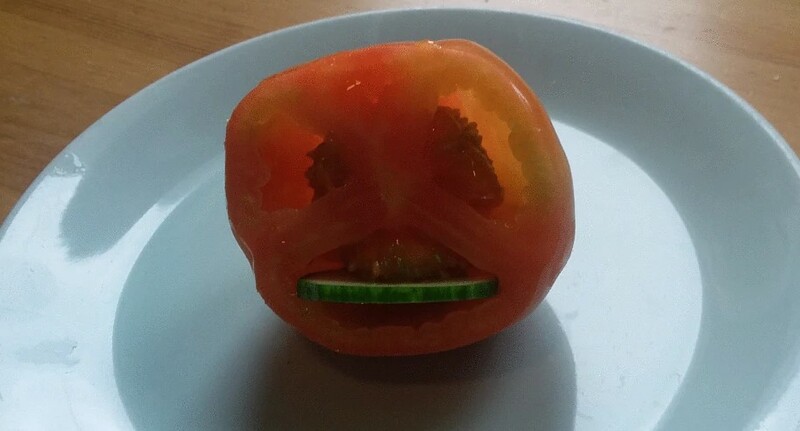 The fact of the matter is that this is a tomato that appears to be eating a cucumber. I don’t know why anyone would go through this amount of effort, but I guess there are people out there with a lot of time on their hands. No one believes that this selfie was an accident. That was a nice try, kid, but the internet is on to you. I have accidentally taken pictures of myself before, and I always look like an idiot. To be fair, I look like an idiot in pretty much every picture that is taken of me. Still, you don’t randomly take nice pictures of yourself. Good selfies take a lot of work. 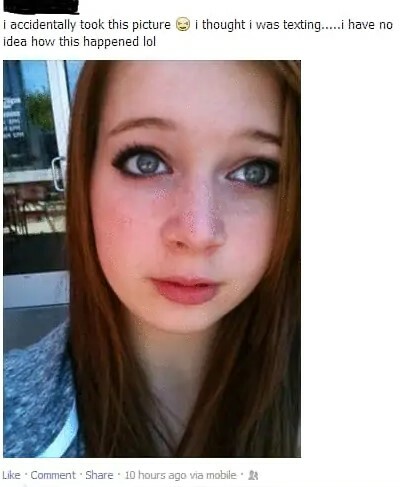 This girl is made up, her hair looks great, and she has a somber, thoughtful look on her face. She’s faking the whole story, clearly. 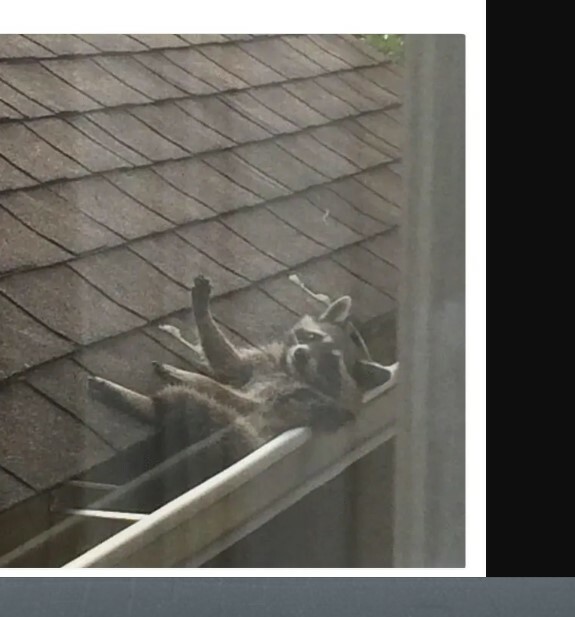 The raccoon seems to be having a decent time hanging out there. I don’t know how it got up there, and I probably don’t want to know. I am not afraid of sharks or even bears, but I am sort of afraid of raccoons. I’m also afraid of deer, but that’s mostly because they could do a lot of damage to my car. I don’t know why I am afraid of raccoons, really. I remember, as a child, one of my many uncles telling me I could get rabies from a raccoon. They’re also relatively intelligent animals, which is sort of frightening. My current dog is a little smarter than I’d like him to be, which sort of creeps me out. My other dog was as dumb as they come, and I liked him that way. In regard to the raccoons, though, I think it is the rabies thing that creeps me out. I know that most cases of rabies are caused by dog bites and bat bites, but I just associate raccoons with rabies. If you contract rabies, there is a good chance you might die. It is a difficult disease to diagnose; by the time you start developing the neurological symptoms of the disease, you are doomed. 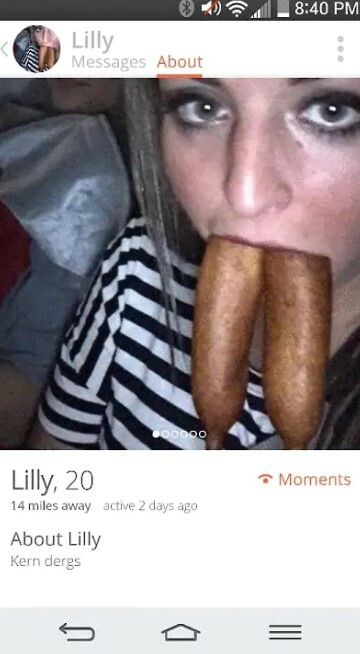 This young woman, Lilly, apparently really likes corn dogs. There are obvious jokes to be made, but this is a classy site, so I won’t make them. I guess the real question here is why Lilly posted this picture at all. She was obviously looking for a bit of attention, and she got it, but aren’t there better ways to get men to notice you? Those inappropriate jokes that I refuse to make were definitely made by at least one guy. All joking aside, this is sort of impressive. I once knew a girl who could fit her whole fist into her mouth, though. Now that was interesting to watch. I have no idea how or why she figured out she could do so, though. That is probably a story that I don’t want to know. There is a joke on some sitcom—I can’t remember which one—about a squirrel army. Apparently this woman actually tried to create one. That must have been one nasty breakup if she went through that much effort. Then again, she doesn’t look particularly sane. I think it is clear why that relationship ended on a sour note. My current dog loves squirrels. My old dog was obsessed with them. His favorite thing in the world, other than eating, was chasing those things. He spend over a decade trying, but he never caught one. He came close a couple of times, but squirrels can be pretty crafty, agile creatures. 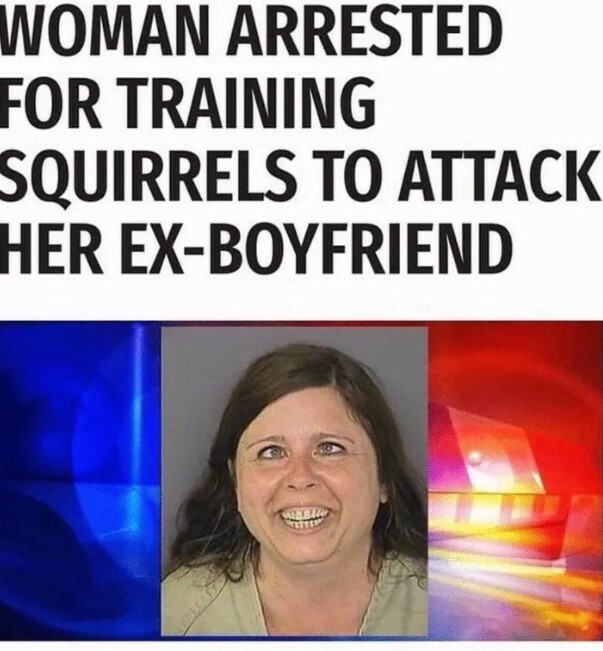 How do squirrels attack people? That’s what I can’t figure out. I have never seen such a thing. Anytime I go near one, they just run away. They have sharp nails, so I guess they just scratch you. Apparently, they also have pretty sharp teeth. I know a lot of people keep them as pets, which I hear is a bad idea. For one, it may be illegal to do so. Also, they have sharp nails and teeth. I don’t think nature intended them as pets. This animal’s owner definitely has attitude. I like it. I think most animals would prefer to be left alone. Unfortunately, I don’t have the luxury of having a pet that likes to be left alone. My dog wants to be petted by literally every person he sees, and he wants to interact with every dog he sees. He also chases birds. He’s a nut. The idiot barks at hawks, which is a terrible idea. A hawk would happily make him into a meal, and they could easily do so. 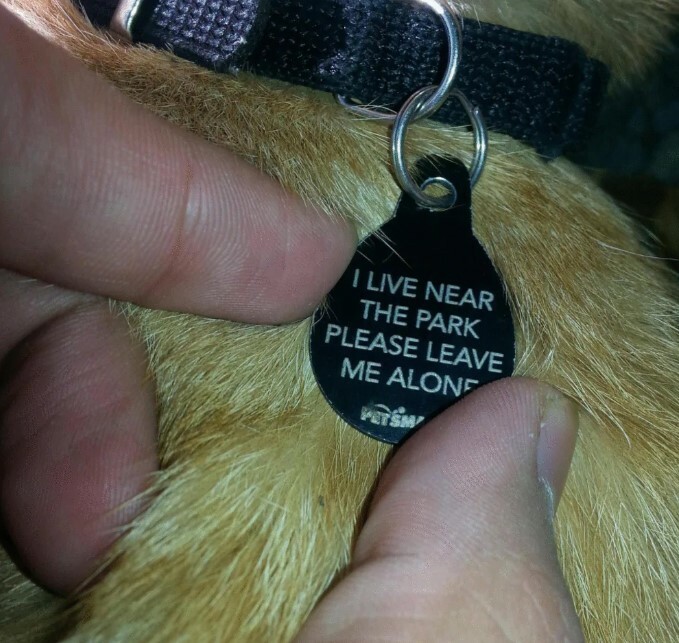 My dog has tags, of course, but if he ever got loose I don’t think I’d ever see him again. He’s smart, sure, but I live near a relatively busy road. He actually did escape once, and by some small miracle a neighbor found him and returned him to me. I’m still not sure how that happened. At the time, he was a puppy; he was basically the size of a small gerbil. I can’t believe the neighbor even spotted him.